‘Ride the Current’ or ‘Go With the Flow’? Of the components mentioned above, the heating element and the control source distinguish hydronic heated driveway systems from electric heated driveway systems. The heating element for a hydronic snowmelt system, as you may have guessed, involves water. Specifically, hydronic heated driveways use what is known as closed-loop tubing to heat the surface of the driveway. The tubing is generally made of a flexible (and quite durable) polymer or synthetic rubber to circulate a mixture of hot water and propylene glycol (antifreeze). The fluid is warmed to temperatures between 140 to 180 degrees F to deliver enough heat for snow melting. A water heater or a boiler is the chief source of heat for a hydronic driveway heating system, which can be powered by any energy source that satisfies the btu requirements, including natural gas, electricity, oil, wood, or even solar collectors. A circulating pump and supply and return manifolds, installed in an easily accessible location, transfer the water between the heat source and tubing. 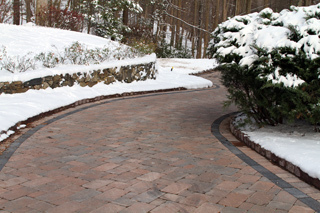 Unlike hydronic systems, electric heated driveway systems use hot wires to heat paved surfaces. These wires are surrounded by layers of insulation, copper grounding braid and a protective outer layer of PVC or polyolefin to form a flexible cable about ⅛ to ¼ inch in diameter. What’s great about the heat cables is the flexibility of the application. Cable is available on spools as well as pre-spaced and woven into mats, and can be customized (cut) to suit virtually any type of layout, including odd-shaped driveways, common walkways and sidewalks, etc. After being triggered by the snow sensor, the control unit then powers the heat cable to warm the driveway. To reduce the power demands (and operating costs), you can install cables in just the tire tracks of a driveway rather than the entire area. Warmzone provides complete system design services to ensure that you receive the best system layout and products for your project. As temperatures plummet and heat bills skyrocket, consumers everywhere are turning to radiant heating systems. As the most affordable and customizable option out there, radiant heating is quickly making a name for itself as a titan in the heating market. So radiant heating is the latest and greatest, but what exactly is so great about it and what can it do for you? One word: customization. When it comes to radiant heating, the possibilities are endless. Warmzone can design a radiant heating system completely customized for your home and lifestyle, and it’s as easy as one, two, three! The first step of your radiant heating revolution is studying the available options and talking with a radiant heat expert to help determine the best radiant heat system for your needs. Radiant heating can be installed under just about any surface, including tile, carpet, wood, etc. Put it in your bathroom, your kitchen, your living room—anywhere you need heat. Each room, or zone, can be controlled with its own thermostat. giving you great flexibility along with outstanding efficiency. Radiant floor heating is an affordable way to keep your house perfectly warm without racking up the electricity bill. You can also enjoy the benefits of radiant heating outdoors. 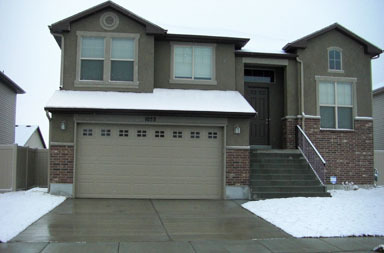 Exterior snow melting systems keep your property safe by preventing pesky snow and ice buildup. There are several outdoor radiant heating products and options, including heated driveways, sidewalks, roof heating, pipe tracing, and portable heating mats; all of which will make your life a little easier in the harsh winter months. We realize that your radiant heating system isn’t the same as the next customer’s, so we’ll work with you to come up with a radiant heating system tailor-made to your needs. 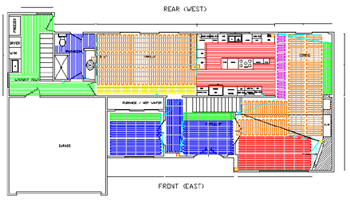 Once we assess your project’s requirements, our team will design a custom radiant heat solution with an AutoCAD of your system, complete with all the technical specs you need so you know all the details prior to any installation taking place. With radiant heating, your only job is to sit back, relax, and enjoy your custom radiant heating solution. Let your heated floors warm your home evenly and efficiently. Sit back and watch from the warmth of your living room as your radiant heated driveway does the shoveling for you. And sleep in peace knowing that your gutters and pipes are safe from nasty and potentially devastating snow and ice buildup. Why settle for an out of the box heating solution? Let us help you customize a radiant heating system that meets your needs, fits your budget, and keeps you and your family warm and safe. 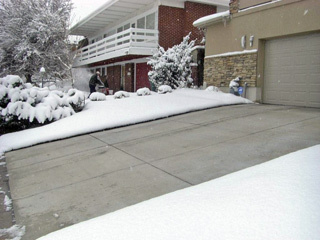 Radiant heated driveways are an aching back’s dream come true and allow you to just say “no” to snow. Face it, each and every time a new snow storm hits you utter words that you wouldn’t say in front of your religious leaders. Each flake that lands on an unheated driveway is another thorn in your side, another creak in your back and a kink in your neck. Homeowners watch in dismay as the skies open up and dump white harmless looking bits of snow crystals on their sidewalks and driveways. Shovels and snow blowers are taxed and so are backs, necks, and arms. Many people just want a way to say “no thanks” to snowy days and back-breaking efforts to clear their property. Heated driveways are the latest rage now and with great reason. Installing a radiant heated driveway saves time and money for every homeowner smart enough to add it to their property. Home values raise, winter blues decrease, and screaming body parts silence in homes that offer the perk of a radiant snow melting system. Check out the many affordable snow melting options from Warmzone. You might be surprised to discover that a heated driveway system is a realistic possibility for you. So, if you are ready to stop cursing Mother Nature, then perhaps a radiant snow melting system is for you. Winter doesn’t have to be the enemy, you could be saying YES, YES, YES to snow once you don’t have to clear it from your driveway. Sure, you don’t want to be a sheep and just follow the crowd, twisting with the fads and turning tides of consumer whims…but some fads turn into life-long investments that can benefit you and your home value. If you ask me (and I know I’m being presumptuous to think you would since we’ve probably never met, but just hear me out) some home improvement investments can actually increase your property value. Want an example of getting while the getting is good? Take the idea of a heated driveway for starters. Think of luxurious winter months spent inside sipping a warm drink or playing games with your kids while your poor neighbors fire up the snow blowers or crank out the shovels. These neighbors clearly didn’t get a radiant snow melting system while the getting was good. Believe it or not spring and summer are the best months to say to yourself “heated driveway…get it, got it, good.” You’ll save money and you’ll be ready super early for the next onslaught of snow, which we hope is many moons away. Still, it helps to think about a ClearZone heated driveway now when the off season has the best deals to offer. Think of it like standing in the holiday isles after the holiday. Plenty of deals to be had, plenty of ways to say get it, got it, good. Do the same for a heated driveway and you’ll be glad you got while the getting was good. With the holidays rapidly approaching do you find yourself scratching your head as to what would be the perfect gift for that special someone? We have a little hint that might get you off the naughty list and onto the “oh boy, are you ever a shining hero on a white horse” list. Giving the gift of warmth and comfort and luxury is closer than you think. I can guarantee that if you give the gift of radiant heat you will never find it in a white elephant gift pile as someone tries desperately to get rid of it. No, radiant heat will earn you major points at home or with family or with whoever you think would enjoy the glowing gift of radiant floor heating. Radiant floor heating is more affordable than ever, so you can actually feel guilt-free about this precious gift of floor heat. Radiant heating systems are also easier than ever to install so you won’t have to muddle through a major home improvement project that uproots your lives through the busy holiday months. Many radiant heating systems can be retrofitted to your existing floors so there isn’t a lot of down time as you cross over from blasé home heating to “wow”radiant heated floors. If you commit to give radiant heat this holiday season we can pretty much guarantee you’ll see many smiles not just on the day you announce this coveted gift, but for many, many days and years to come. Ensure my pipes don’t freeze during the winter. Rejoice when spring comes and my pipes made it through another winter without freezing. Pipe freeze protection is vital to keeping a home, office, or production facility up and running. The Powerblanket can be a great solution for pipe freeze protection. The insulated heating mats are unique in both durability and versatility. Using a heating blanket such as the Powerblanket to wrap and secure a consistent temperature for your pipes is a simple solution to pipe freeze protection. As long as a Powerblanket is plugged in and running, the warming properties of this unique heating blanket allow you the peace of mind to walk away from your pipes, even on the coldest nights in the dead of winter. So if you buy and use a Powerblanket, the worry of having your pipes freeze can be safely checked off your list. How Much Wood Could a Woodchuck Chuck in a Pile of Snow? Could the Woodchuck Chuck More Snow than ClearZone Heat Cable? Sure, it will probably never happen, but it is kind of fun to think about. Picture a beefed-up, squirrely little woodchuck taking on a snow storm versus the melting power of ClearZone heat cables. His furry little arms would be fast and furious tiny windmills as they scooped at the endless mounds of snow surrounding him. All the while the ClearZone heat cable would use the smart principles of radiant heat to work far less with far better snow melting results. The poor little woodchuck would perspire, breathe heavy, and wear out faster than a hippo running a marathon. Yet the ClearZone heat cable would sit calmly beneath the surface working silently to melt the snow above. Maybe this scenario is proof that winter has been too long for me and my mind has started to wander to far off places because of the snow blindness and cabin fever. However, crazy or not, the idea of anything or anyone or any animal (poor little woodchuck) beating out the power of an automatic snow melting system when it comes to snow removal is frivolous. The snow melting systems that utilize ClearZone heat cables allow you, the user (or the woodchuck if he gets a good job to pay for it) to enjoy winter without the hassle of constant snow removal. It would give you and that wood chucking varmint a much needed rest. Ok, here’s the deal, if you don’t know much about radiant floor heating you need to get up to speed and fast. You’ll miss the radiant heating boat and trust us, there are a lot of people clamoring to jump aboard and enjoy the warming effects of warm floors. You should secretly vow right now to treat yourself to the luxurious, yet remarkably affordable joy of radiant heated floors. There is nothing quite like stepping sans sock onto an otherwise cold surface only to find it surprisingly and appealingly warm. Those first steps taken on a radiant heated floor will make you wonder why you didn’t take this vow sooner. Radiant heat provides constant and consistent heat throughout your floors, warming everything around it, unlike forced air systems that blow warm air that rises quickly and settles near the ceiling and sneaks out the cracks of your walls, causing the whole system to kick on once again to replenish what has been lost. Forced air systems create more allergies with all that air and dust moving around, a problem easily avoided with radiant floor heat. With radiant heating the radiant heat cables beneath the surface of your floors generates warmth that permeates the surface and all the spaces around it leaving your living space inviting and comfortable. Keep this vow to treat yourself to something irresistible and warm and you’ll soon realize that radiant floor heating is a decision you won’t end up regretting. If you find more and more of your outdoor projects are taking you away from home, do not fret. Some projects are close to home, while others take you a little further from your handy tools work space. 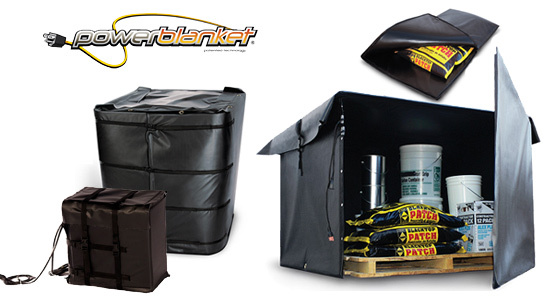 If you require a outdoor warming blanket, a battery warmer, barrel heater, engine warmer or insulated heating blanket of any kind, the Powerblanket has a portable heating solution for you. The innovative Powerblanket is a weatherproof heating mat that can be plugged in to any 120V outlet. The portable heating mats may be linked together to achieve specified lengths for a variety of projects and uses. People everywhere need a way of transporting all their equipment. The ingenious thing about the Powerblanket is that they can be packed up and moved to different sites with relative ease. The concrete curing blanket has many uses and can even be hung to cure walls and columns, leaving it unrestricted from ground use. The portable heating mats may be used in large scale construction projects as well as small home improvement projects and can be transported back and forth between each site. The portable heating mat known as the Powerblanket is handy on just about any outdoor job. Pack it up and you are ready to move.